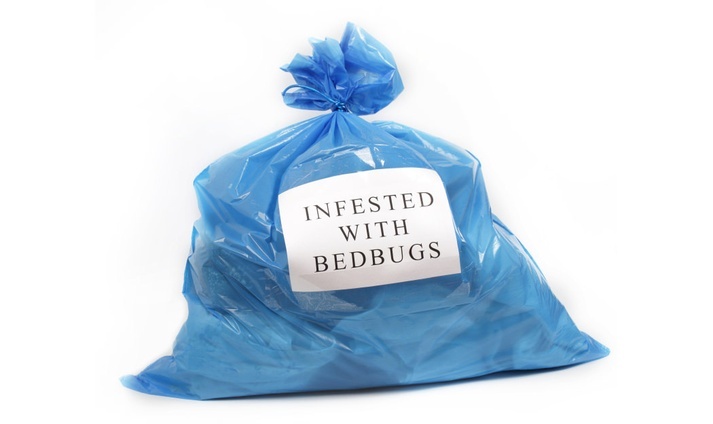 What to do if you think you have BED BUGS! Don’t begin sleeping in another bed, or on the sofa. Do not go to stay with someone else. The bugs may follow you, and then it will be much harder to get rid of them. Staying outside of your home means the bugs may become dormant. They can live without feeding for up to 18 months. When you come back, they can begin biting you again. So staying in your home during treatment, and sleeping in your usual bed, is the way to kill bed bugs. Once you are being treated, you must remain in the bed–you are the bait, attracting bugs to the poison and their deaths. If you isolate the bed, they need not bite you. Do save any bed bugs you find. You may need to show them to landlords, pest control professionals, and so on. Pick up with clear packing tape, and tape the specimen(s) to an index card. Don’t assume you’ll see lots of them, most people don’t. Do rule out other possible conditions, like folliculitis, scabies, and bites from other insects.. Be warned, though, that many of us are told by doctors that we do not have bed bugs, and later find they are wrong. Many of them have never seen bed bug bites, or have seen only some patients with them. Bites can range from large welts to small red bumps, to scabby pimple-type bumps. Don’t start buying a load of chemicals and treating yourself. Remember, pesticides have different qualities (repellents, contact killers, residual killers, growth regulators, etc.) Bed bugs are probably the most complicated pests you’ve ever encountered at home. If you start spraying pesticides, you may disperse the bugs, and the professionals may have trouble treating them. You may spread them around your home. Do not, absolutely do not release a fogger or bug bomb. Do not allow your landlord to do so. Do not allow a so-called exterminator to do so. Bug bombs / foggers do not work for bed bugs, and in fact, will spread them. Your problem will be magnified. Do start dealing with your clothing and linens. Though you should not simply seal your possessions in bags, it is probably a good idea to start working on clothing and bedding, since the PCO is going to tell you to do this, and it takes time. You should take clothing and other items, wash them in a machine on hot 160 degrees, and dry them on hot for 1-2 hours. Remember, driers vary as to their strength and how long they take with what size of load. My personal method is that items should at least be dried on hot for 20 minutes after they appear to be fully dry and very hot. If you want to be cautious, go for two hours on hot. Dry cleaning is okay too. Keep in mind that pillows, comforters, down coats, and other thick items may take longer. Here’s the key: after washing and drying, bag items in sealed, airtight bags, and do not remove them until use. Don’t assume bed bugs are only in your bed. While bed frames and mattresses and headboards are the most likely location for bed bugs, they can and do often hide out in sofas and other soft furniture, electrical sockets (behind plates), light fixtures, baseboards, floor crevices, and other crevices in the bedroom and living room. Bed bugs are occasionally found in kitchens and bathrooms. This should not make you panic: most cases, especially smaller ones, are quite concentrated, usually 10-20 feet from where people sleep (or where they sit for extended periods). However, if a PCO tells you bed bugs are not found in living rooms, realize that many Bed bugs have infested sofas, computer chairs, and so on. Don’t believe that bed bugs only bite at night. They prefer a sleeping, stationary host who is fast asleep. But if they’re hungry, they’ll take what they can get. You can be bitten while in a chair, awake.